If you’re a true coffee lover, chances are you’re partial to a shot of espresso. The process of espresso making has been honed over the centuries in Italy. Espresso making is the only method that can fully optimize the 800 compounds in roasted coffee without also allowing naturally occurring acids like tannins to taint the brew. You brew espresso by forcing near-boiling pressurized water through your ground coffee and filter. Espresso is very thick and highly concentrated. A great shot of espresso gives you everything you want in your coffee and nothing you don’t want so how can you recreate that at home? With so many espresso machines flooding the market, there’s every chance you’re feeling confused. Today we’re here to help you with our look at the very best automatic and super-automatic espresso machines on the market. The Breville Oracle Touch gives you all the convenience and speed of a super-automatic espresso machine with the flexibility of a less automated model. Choose from a wide array of long and short coffees remaining in control from bean to cup. Whether you want a no-nonsense espresso or a leisurely latte, investing in the Oracle Touch will save you money over time if you stop making expensive coffee shop runs and enjoy your drinks at home instead. What’s the difference between these different types of espresso machine? If you spot push-button functionality, it’s an automatic espresso machine. As the name suggests, the machine does pretty much everything for you. The coffee and water will be measured and dosed so all you need to do is choose between a single or double shot and hit the button. It doesn’t get much easier than that. Most automatic espresso machines come with onboard grinders. With all main functionality taken care of at the press of a button, all you need to do is load up the filter and froth the milk and you’re good to go. Automatic espresso machines are extremely simple to use but they will require some cleaning. With a super-automatic, all you need to do is pop your cup in the tray, push a button and wait for your golden shot. While you’ll usually be able to make very small adjustments to grind size, you’ll otherwise have very little control over the variables. Another major downside of super-automatic espresso machines is that they normally require professional cleaning. Many super-automatic espresso machines come packing a milk tank that froths and pours milk, perfect for cappuccino and latte. Most have an integrated grinder. If you’re not especially fussy about dialing in your shot, there’s little to beat the convenience of a super-automatic. If you want a more hands-on experience, check out our article on the best semi-automatic espresso machines. There are some simple tactics you can use to simplify any buying decision. Work out a budget and stick rigidly to this. Not only will you safeguard yourself against rash overspending, you’ll immediately whittle down your options and streamline your shortlisting process. Once you’ve got the money straight, it’s time to double down on reading plenty of user reviews. Whether these are aggregate reviews or based on extensive testing of products, you can get an overall feel for where these espresso machines stand and fall. 1. Category of Espresso Machine: Do You Really Want an Automatic Machine? This might seem like a foolish question but it’s key if you want to end up with a coffee machine ideally suited to your needs. The primary advantage of an automatic machine is convenience with speed coming a close second. On the downside, you generally won’t be able to make as many adjustments during the brewing process. Be aware that some dual boiler machines perform poorly in North America on 110 volts so look closely at the voltage issue if you’re interested in a dual boiler. Once you’ve dialed in the style and type of espresso machine you’re after and you’ve got some options in view, think carefully about how easy it is to use. It’s pointless investing in an appliance to save you time and effort if it ends up giving you a headache to navigate. Think about the controls and how easy they are to access and think also about how conveniently the machine will pop on your counter top. An automatic espresso machine preparing cappuccino. When you’re investing a considerable amount in an automatic espresso machine, you should place build quality and durability uppermost. Most machines at this price point will come in stainless steel or aluminum and they’ll have varying degrees of plastic components. Double down on user reviews where people will generally be pretty honest if a product has let them down. You generally get what you pay for and espresso machines are no different. 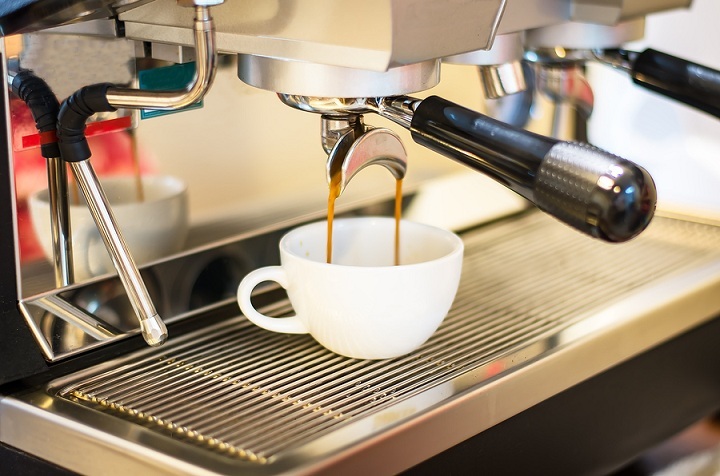 While you can get a perfectly serviceable machine without bankrupting yourself, if you’re looking for the very best coffee, you’ll need to dig a little deeper. Let’s face it, cleaning espresso machines can be a real grind.Look for models that include at least some degree of auto-cleaning so you’ll have at least some of the work taken care of. Beyond this, look for parts that detach easily and keep your eyes peeled to determine whether the machine you’re interested in is dishwasher-safe if that’s a priority for you. Most of the best machines should demand relatively little upkeep. 6. What Degree of Customization Can You Achieve? One of the chief drawbacks with super-automatic espresso machines is the fact you’re largely thrown at the mercy of pre-sets. If you prefer to exercise a little more control over your brew while still enjoying the convenience of an automatic machine, look for models allowing you to make adjustments to water temperature, froth and coffee strength as well as the type of drink you want. Many automatics now deliver a surprisingly flexible experience. If you don’t deviate from espresso, it makes sense to angle toward one of the more basic and limited machines. Why pay for what you don’t use, right? For larger families with varying drink demands, it pays to target a multi-purpose machine that will dole out latte and macchiato rather than being dominated by espresso. You should have a reasonable idea now about what to look out for when you’re tracking down an automatic espresso machine. We’ll get straight down to business now with our look at 10 of the very best super-automatic espresso machines so you’re spoiled for choice. Breville’s latest iteration of the Oracle Touch is not cheap but the best things in life rarely are. If you want all the convenience of a super-automatic espresso machine while still remaining in control of the brewing process, the pioneering Oracle Touch occupies a niche of its own. Whether you want to make use of the color touch screen and the intuitive automation for a seamless, almost hands-free espresso experience or you prefer to hit override and operate the Oracle manually, the end result is the same: a mighty fine cup of coffee in 60 seconds flat. The integrated burr grinder ensures you get a uniform grind every time, essential for consistency in your espresso. You can easily tweak the grind size allowing you maximum flexibility whether you’re looking for a short, sharp espresso or a frothy latte. Once ground, the machine will tamp the coffee automatically into the portafilter. This enables you to exert the same pressure every brew, another way of dialing in the variables. You can let the Oracle froth your milk expertly or use the wand and whip it up yourself. There’s a pre-set extraction system in place although you can tweak the times if you are extremely particular about your espresso. Thanks to the dual burner, you’ll be able to extract your coffee while also steaming milk resulting in your drink served in under a minute. This speed of operation is one of the key selling points of the Oracle. It’s ideal for anyone with a hectic schedule but not prepared to compromise on choice coffee. 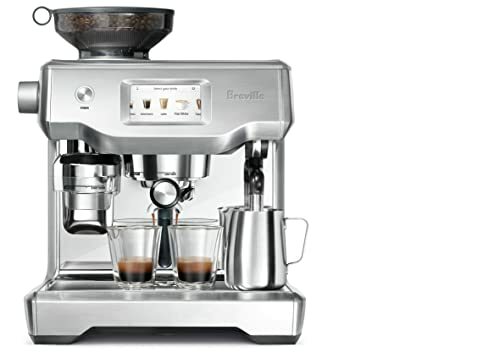 One thing that elevates the Breville above most of the competition is the variety of drinks at your disposal. Whether you want a jolt of espresso or a leisurely long black, you can choose from 5 preset beverages with the ability to program in 8 more of your design. The polished steel finish has a fingerprint-resistant coating so it will still look slick on your counter after years of faithful use. 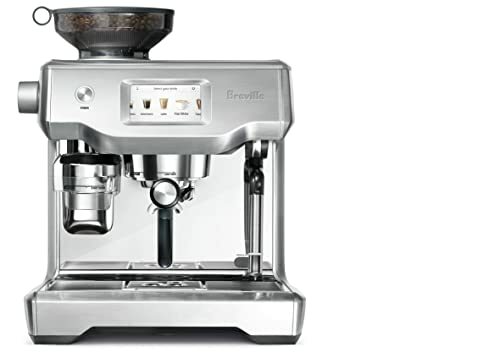 If you’re looking for a top-notch espresso and you’re caught between the simplicity of an automatic machine and the flexibility of a semi-auto, the Breville Oracle Touch is in a class of its own delivering just what you’re looking for. While it’s not cheap, there are far more expensive options out there, and overall it’s our top pick super-automatic espresso machine. With over 30 years in the trenches building first-class espresso machines, Jura is a Swiss brand with immaculate heritage. The Impressa C65 is not cheap but it represents outstanding value for such a capable automatic espresso machine. Once you step up into this territory of machine, there are no cheap options but the Jura is the next best thing and our best budget pick. Where many coffee machines look relatively bland and samey, the striking Impressa will make a statement in any kitchen with its combination of a minimalist palette and curving angular lines. Jura specialize in beans to cup machines and from popping your preferred beans into the conical grinder onboard through to the piping espresso in your glass, the Impressa takes all the hard work out of this brewing method. Unlike many espresso machines which are incredibly complex and awkward to use, the Jura has a central color display and a rotary switch so you can flick through the menus seamlessly. If you prefer longer drinks, you’re spoiled for choice with 13 styles of coffee from espresso through to macchiato and latte. Frothing is first-rate so you can enjoy the finest longer drinks not just the best shot of espresso. While you might generally like using fresh coffee beans and grinding them just before drinking, sometimes you might also fancy using pre-ground. Maybe you just want a quick cup of decaf without needing to empty out the hopper. It’s nice to have this option, even if you don’t make use of it very often. You should never overlook the importance of water when aiming for the best coffee. You’ll get a replaceable water filter with the Impressa which is ideal if you live somewhere where the water supply is too hard or soft for your liking. Speed is of the essence with this super-automatic espresso machine. A large part of the delay with many machines is the need to heat the water. The Impressa does this as it passes through the machine so you’ll have a tasty drink in your cup in no more than a minute. Since you have such a broad spread of choice when it comes to drink type, you’ll appreciate the adjustable spout so you can easily accommodate even much taller cups and mugs without spilling coffee everywhere. If you’re looking for an entry into the world of super-automatic espresso machines without bankrupting yourself, you can’t beat the Jura Impressa. You’ll be covered by a warranty for 2 years or 6000 brewings, whichever comes first, so you can buy without any headaches. If you’re looking for a fully automated espresso experience from a brand you can trust, the DeLonghi Prima Donna might be just what you’ve been waiting for. With any super-automatic espresso machine, user-friendliness should be uppermost. It’s senseless having a machine packed with features if you struggle to navigate. From the oversized color screen through to using your smartphone via Bluetooth for control, functionality is intuitive and seamless. You’ll get a bewildering array of 15 drinks to customize so there’s something for all the family. The adjustable burr grinder gets things started properly with beans ground to match your chosen beverage. The additional chamber lets you add pre-ground coffee which is ideal if you fancy a quick decaf without going through the rigmarole of emptying out the hopper. With dedicated heating elements for espresso and milk, you’ll enjoy a consistent temperature to go alongside perfectly ground beans. You can dial in your beverage further using the simple and intelligent programmable machine so you’ll get the drink you want when you want it without needing to hit the coffee shop. The proprietary crema system kicks out very dense and rich foam to set off your coffee a treat. The level of customization means the Prima Donna works well with larger families. You can stick with your regular espresso while your wife can experiment with latte macchiatos and your kids can enjoy a glass of hot milk. The Prima Donna would also work well in a small office setting. If you work alongside several others who make twice-daily trips to Starbucks, it’s well worth thinking about investing in this nifty super-automatic and you’ll recoup your costs in no time. Many super-automatic espresso machines are a real bind to keep buffed up. The DeLonghi has a detachable brew unit which is extremely quick and easy to clean. DeLonghi has achieved the ideal marriage of form and function with the Prima Donna. The sharp lines and sweeping curves along with premium finish means this machine will grace any counter top or office kitchen. All touch points are designed to be easily accessible from the front so operation really couldn’t be much easier. If you enjoy great coffee but you prefer automation to total control over the brewing variables, the DeLonghi Prima Donna is well worth popping on your shortlist. You’ll get a rich variety of drinks at your disposal and your part in the process will involve little more than pressing buttons and waiting for your espresso on demand. Our hands-down winner for the best super-automatic espresso machine under a thousand bucks is another DeLonghi, the enduringly popular Magnifica. As far as fully automated machines go, this is about as cheap as it gets while still enjoying premium build quality and great brand heritage. You should bear in mind that a coffee machine at this price point is not built to the same exacting standards as a five-figure commercial unit. While some customers have raised concerns about durability, if a machine like this lasts a few years, you’ll already have got great value. You need to be realistic about your expectations when you’re buying a cheaper appliance of any kind. As with most of the best automatic espresso machines, you can either make use of the conical burr grinder to smash up your own beans or you can opt for pre-ground when the fancy takes you. A combination of rotary and push buttons give this machine a classic look with a modernist twist. The main deal lets you tailor the intensity of your drink and the surrounding buttons take care of whether you want a long or short coffee along with other drink settings. While initially confusing, the DeLonghi really is a cinch to use after a couple of attempts. Programming your espressos couldn’t be easier the dual output allows you to pour a pair of drinks simultaneously, ideal if you and your partner are rushing around to get ready in the morning and time is of the essence. When it comes to longer drinks, there’s a superb manual steam arm you can use to whip up the perfect froth for your drinks. You will need to take care of this by hand so this is where you lose out on a fully automated unit. That said, once you’ve got to grips with frothing, you’ll be able to exercise complete control over just how your drink is finished. A nice extra, especially on a budget espresso machine, is the ability you’ll have to adjust the coffee temperature. As well as remaining in complete control here, you’ll also be able to tweak the grind settings through 13 pre-set options giving you the ideal consistency for any drink you want. As long as you don’t mind manually frothing, the DeLonghi Magnifica is a superb espresso machine at an incredible price point even if you have a more compact kitchen with limited counter space. Space in the kitchen is almost always at a premium. If you love coffee brewing, you’ll know how easy it is for your equipment to start taking over the counter tops as you add one appliance after another to your brewing arsenal. Why not put a stop to that by investing in a highly compact super-automatic espresso machine with everything you need included? Bean-to-cup machines will always polarize opinion. Purist turn their noses up at the lack of control you’ll have over brewing variables while busy coffee lovers who place speed and convenience over fine-tuning brewing can’t get enough of them. We’re not here to try to convince you to change your way of thinking and only you know what makes the best fit for you. Although it’s fully automated and extremely feature-rich, the Miele is a pleasure to use and you don’t need to be a tech-lover to extract the best from this machine. Sensors give you audible warnings when you need to refill or clean up. The onboard grinder is effective even if it does kick out a fair racket as it preps your beans. You’ll find shortcut buttons for espresso, cappuccino and latte macchiato with the remaining longer coffees easily accessible through the menu system. Flat white is the only notable omission although the ability to make hot chocolate is a wonderful extra. If you roll with the pre-set coffees, you’ll get robust yet balanced drinks with the minimum of fanfare. If you prefer to exercise a little more control, you can add your shots, hot water and treated milk separately. The beauty of this machine is you can let it do all the work or you can step in and fine-tune things when you fancy. The spout is adjustable to accommodate any size cup you choose to use and there’s a dedicated hot water spout which can come in very handy. The striking design of this espresso machine means it makes a real statement. You can opt for a black or white finish to complement the rugged stainless steel so the Miele slots brilliantly into modernist kitchens. Although build quality and the end result in your cup are faultless, speed is certainly not of the essence. You should be clear before considering this machine that there are many much quicker options if you demand your espresso in 60 seconds flat. If, on the other hand, you don’t mind waiting a few minutes and you appreciate top-notch coffee, the Miele performs admirably across the board. All Jura machines are fully automatic and if you love espresso done the right way, the Ena Micro 5 is a solid choice. As with all the best fully automatic machines, you get the brewing process started right with the integrated grinder. If you want the freshest coffee, it’s key to grind those beans just before you start brewing. This machine places the focus firmly on espresso so you won’t get a milk steaming mechanism included. On the plus side, that means there’s one less thing to worry about going wrong. If you’ve got a cramped and busy kitchen, coffee equipment can spiral out of hand. This is one of the major selling points for bean-to-cup machines. With no need for a separate grinder, you can get everything you need in one squat, lean package. The principal downside of these scaled-down dimensions is a smaller grinder capable of prepping for just a handful of coffees. This does mean, though, your beans will always be as fresh as possible. You’ll only get to choose from espresso, ristretto and a regular long coffee so if you’re looking for a welter of choice and frothy confections, the Jura is not for you. If, however, you’re an espresso fiend and you prefer automation to tinkering over brew variables, the Micro 5 is a must-try. Using the ergonomic touch screen, you can choose to brew a single or double dose of your favorite coffee. Since there’s no milk frothing to be concerned with, all you need to select is the strength and cup size and your shot will be conjured up quick-smart. The rotating espresso dispenser is more than a canny marketing trick. Where most automatic machines dispense a single shot through 2 valves, the Jura does it with 1 valve. All you need to do is twist the dispenser to double up. Height-adjustable spouts let you slip even larger travel mugs in fuss-free. While the Jura is certainly not cheap, you could spend far, far more for a super-automatic espresso machine. Surprisingly for a unit at this price point, build quality is impeccable and, as long as you don’t use it all day every day in a commercial setting, you should get many years of happy use from your Micro 5. If you want a no-nonsense and entirely automated process to get the best espresso outside your local coffee shop, the Jura is worth adding to your shortlist. As we move through the best super-automatic espresso machines on the market, we’ve got another entry from the ever-reliable DeLonghi. The Eletta is a super-automatic so, as with all these machines, they are not the wisest bet if you want to meddle with variables as you brew. If time is too tight to mention, though, the immediacy of a serviceable espresso whenever you want one is hard to beat. Unlike the more basic Jura, you’re spoiled for choice with drinks here. Whether you want a neat and short espresso bolted down before work or a milky latte macchiato to enjoy in the afternoon, choosing your drink is a breeze. You get 3 single touch options (latte, macchiato and flat white) then you navigate the milk menu for further choices of longer drink. If you have a larger family with varying tastes, investing in the DeLonghi is a smart move. The burr grinder runs very quietly which is a nice bonus. There’s little worse than an unexpectedly loud grinder, especially if you’re up early in the morning and you don’t want to disturb the family. You’ll be able to adjust your shot strength from short to extra-long and the Eletta remembers your settings, making automatic adjustments when you opt to double the dose. If you fancy a longer and milder cup, hitting the Long Coffee button yields you a cup roughly comparable to classic drip coffee. This along with the range of milky drinks up your sleeve means the Eletta covers all main bases impressively. Using a trio of icons on the carafe, you’ll be able to tweak the texture of your foam to suit. Whether you want a classic latte macchiato or a more luxurious cappuccino, you can froth precisely and consistently safe in the knowledge the frother cleans itself after use, eliminating one of the messy jobs that blights many super-automatic espresso machines. The Eletta is not the smallest espresso machine although it’s designed to slot under cabinets so you’ll be able to make the most of counter space. This size translates to a substantial 10oz bean hopper and a hulking 2-liter water tank so you’ll gain overall as long as you have the room to accommodate this sleek beauty. If you’re looking to enter the world of super-automatic espresso machines but you’re not quite ready to relinquish all control, the DeLonghi Eletta is a great compromise. You’ll be able to customize your drink without any tedious legwork and you won’t need to sacrifice your cappuccino in the quest for the perfect espresso. Gaggia is a household name in the coffee machine industry and the Brera is yet another example of how design meets performance in a surprisingly pocket-friendly package. At first glance, the commanding steel front of this machine is flanked with plastic which cheapens the look to some extent. That said, you’ll have no problems with build quality and the overall aesthetic is still striking. The ceramic burr grinder won’t generate too much noise and you can fine-tune the coarseness of grind so you can get things started from your optimum base. While fit for purpose, this grinder doesn’t return the best results so if you’re really serious about the quality of your coffee, you might consider bypassing the hopper and popping in some pre-ground instead. The Brera transforms pre-ground into truly excellent espresso. With fresh beans, the result is by no means poor but it’s underwhelming. The Gaggia’s control panel is a pleasure to use even if you’re not the biggest tech-fan. You’ll get going straight out the box and using an espresso machine really doesn’t get much easier than this. This machine is a great starting point if you find the array of options on some super-automatics confusing and you want things striped down to basics. You can make some adjustments to settings but if you want to roll with the pre-sets, getting the best espresso is as simple as hitting a few buttons and letting the Brera do all the heavy lifting for you. As with every decent super-automatic, there’s the option to slip in some pre-ground beans as well as popping beans in the grinder. The steam pipe heats up incredibly quickly for milk frothing, one of the many ways in which Gaggia harnesses technology to bring down brew times and ensure you get your espresso without any tedious downtime. The Pannarello steamer wand might not do the trick for the most intricate latte art but it’s more than adequate for frothing the milk for your macchiato. There’s a rinse cycle which helps take care of basic cleaning in the background. You’ll need to put in a little work yourself although all components detach easily and it maintenance won’t present too much of a headache. If you like your espresso super-strong, the double-up option is particularly effective. Rather than simply forcing through twice the amount of water, the Brera grinds a second load of beans making sure you get that charge of caffeine you’re looking for not a watery disappointment. For an entry-level automatic espresso machine, the Gaggia Brera punches above its weight. As we near the end of our super-automatic espresso machine reviews, we’ve got another fine unit from Gaggia, this time the Accademia. This super-automatic gives you a great deal of scope when it comes to drink selection while minimizing your input to simply pushing a few buttons and enjoying coffee in less than a minute. You access the simple but efficient grinder from the front of the machine. There’s a hopper included and the aroma saver seal makes sure your coffee keeps all its flavor and taste without losing that nose-tingling smell. You can choose from 7 pre-set drinks ranging from a short, stiff espresso through to a leisurely latte macchiato. You can also pull off hot water if you fancy racking up a cup of tea or some hot chocolate so you’ve got far more flexibility than if you focus on a straight-up espresso machine. As well as a pared-down simplicity, speed is one of the chief selling factors with the Accademia. Roll with one of the default coffee options and you’ll be sipping away in less than a minute. On the milk front, you can flit between minimal and normal or slash the froth completely for shorter drinks. Since the Gaggia comes with 2 stainless steel boilers, it will take care of brewing and frothing at the same time, largely responsible for the impressive 60 second brew time. The milk carafe detaches so you can stash it in the fridge if required. It should slot neatly into most standard door shelving. One of the notable drawbacks with the Gaggia is the water temperature. This only hits 170 degrees Fahrenheit or so. If you’re a purist, you probably wouldn’t be interested in a bean-to-cup machine anyway, but it’s worth being aware that you won’t get scalding coffee from the Accademia. If you want an efficient and quickfire espresso machine that’s a pleasure to use, you should take a closer look at the Gaggia Accademia. Let the machine take care of everything from grinding to brewing leaving you with nothing to do except sup down the finest coffee done just the way you like it. As a nice extra, there’s a pre-brewing mode to fire things up and ensure you get the very best possible extraction every time. Last but by no means least in our super-automatic espresso machine reviews is another model from the mighty Jura, this time the Giga 5. The Giga 5 brings design and function together to deliver the very next best thing to a coffee shop drink without needing to choose a much more expensive commercial espresso maker. So, while the Giga 5 is undeniably expensive for a home machine, you’re getting a great deal of bang for your buck if you can afford it. The choice of drinks at your disposal is class-leading. From a regular espresso or latte through to flavored latte macchiato and mango lassi, you’ve got 17 mouth-watering pre-sets perfect for large families or gatherings when everyone likes different drinks. We’ve just listed out just a selection of these tasty beverages below. A pair of ceramic disc grinders get things started with raw efficiency and you can always enjoy your grind precisely as you like it. If you opt for barista mode, simply use the rotary switch to navigate a menu of gourmet pre-set drinks taking all the sting out of making specialty coffee. Once you familiarize yourself with this system, it’s incredibly quick and intuitive and simple enough for anyone to get the hang of. With each drink, you can tweak strength, size and water temperature allowing you control over many variables you can’t normally influence with super-automatic espresso machines. You’ll also be able to doctor the amount of milk and foam so you can still inject some personality into your brewing. We have to say the plastic cheapens the aluminum chassis to some extent but the overall look is sleek and commanding. You can also get this machine with a matte black finish. If you’ve been hunting down a super-automatic that does all the hard work for you while still allowing you to dial in your brewing to taste, the Jura Giga 5 is certainly not your cheapest option but it’s undeniably one of the best. If you’ve been tempted by some of the automatic espresso machines on today’s menu but you’re still not sure if you can stretch to it, read on for some handy hints on managing the expense of a new coffee maker. It’s difficult to read anything about espresso machines without seeing a comparison between the money you’ll spend and the money you’ll save by sidestepping your morning or lunchtime Starbucks. Thing is, you won’t achieve this saving unless you start avoiding the coffee shop. You could easily get through north of a thousand bucks a year on chain store coffees so if you consider either eliminating or at least cutting back here, you can recoup your investment in as little as a year or two. While we’re not suggesting you should spend beyond your means, you should certainly aim for the most expensive machine you can afford. You might be lucky and find a cheap automatic espresso machine that not only works well but also lasts the distance but the majority will simply not pass muster. You don’t need to go over the top and buy a hulking commercial unit meant for a busy coffee shop but you should certainly look for quality above all else. If you want an espresso machine that looks and feels like new without the eye-watering price tag, you might want to at lest think about a refurbished model. These machines are either demo models or returns and they’ve been prepped so they look like they just came out the box. You’ll also benefit from a warranty not just an aggressive discount. Do you work in a small office where you often end up slipping out to the local coffee shop? If so, it’s worth thinking about clubbing together with your colleagues and investing in an espresso machine together. Not only does this take the sting out of buying the whole machine yourself, you’ll end up recouping your modest investment in no time while still enjoying coffee of a comparable quality. By taking the time to think in advance about what coffee you drink most and how involved you want to be in controlling the brewing variables, you can avoid spending money for features you don’t want and will never use. It’s amazing how many people get this wrong. Are you a devout espresso fiend? If so, why outlay more than you need to get a machine with 17 different drinks? Equally, don’t sell yourself short with a one-trick pony of a machine if you like a varied range of coffee. Get these basics right and you might find that machine doesn’t seem quite so expensive after all. We very much hope you’ve enjoyed this exploration of the best super-automatic espresso machines and you’ve found a machine that tempts you. Many of the machines we review offer a surprising amount of customization so you can still feel in full control while also lightening your load and letting the machine do the work. Drink-wise, you’ll also find most of the machines we look at deliver far more than a short, strong espresso. Whether you’re partial to a leisurely latte or a rushed ristretto, you’ll be able to get premium short and long drinks from the comfort of home. There’s no right or wrong answer to what makes the best super-automatic espresso machine since everyone has different needs and priorities. If you scour through the models we review, though, there’s sure to be something to suit your taste and budget and they are all solid options. Feel free to drop us a line if you have any queries or feedback at all. We’re always delighted to hear from our readers and we’re happy to help in any way we can. The Breville Oracle Touch gives you all the convenience and speed of a super-automatic espresso machine with the flexibility of a less automated model. Choose from a wide array of long and short coffees remaining in control from bean to cup.